The huge growth in the availability of MDF buildings for wargaming in recent years has definitely made scenery more affordable, especially in 28mm. However, they are not to everyones liking – I must admit that I much prefer using resin buildings for brick or stone structures. New company GameTerrain.co.uk is launching on Kickstarter at the moment with this thought very much in mind. 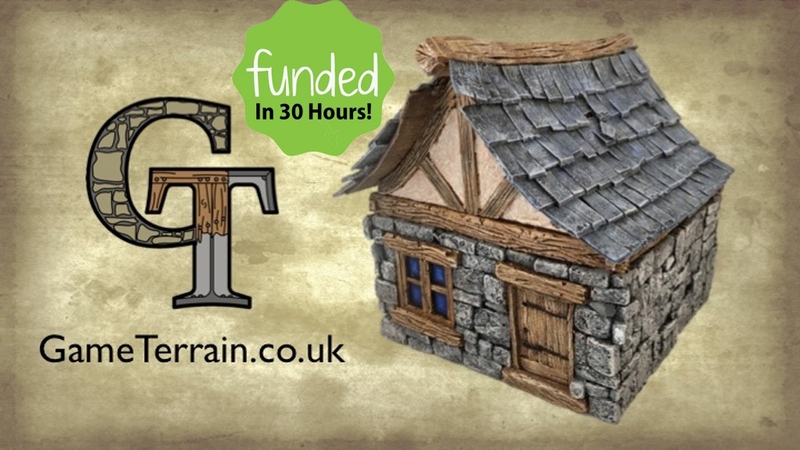 They are looking to produce resin 28mm buildings suitable for fantasy gaming. Their aim is to eventually have a range of around 26 individual models to choose from, but they are starting their range by launching 3 – although this may increase should product funding allow. The first two buildings are the Old Shed (above) and the Ramshackle Hovel (below). The Shed is 50mm x 50mm x 75mm, whilst the Hovel is 100mm x 100mm x 100mm. The Hovel comes in two pieces, as it has a removable roof. They are priced at £9 and £24 respectively. These will be shipped in September 2016. In addition to this, GameTerrain also has a much larger model on offer. The Traveller’s Rest is a large construction, 300mm x 300mm x 250mm, which consists of two buildings: a stable and an inn. This is available for £90 and is due for delivery in October 2016. The project is running until the 9th August, is funded and at time of writing is just short of its first stretch goal. There are three stretch goals available – each of which is an additional building for the range. I really like the design of these models, and I am very interested to see how they are going to expand the range. In the mean time I wish Lee and the guys at GameTerrain all the best with this new venture – it’s well worth looking at.